The Holyoke Range is a modest line of mountains, 9.5 miles long and 2.5 miles wide, that runs east-west through the towns of Hadley, South Hadley, Amherst, Granby, and Belchertown in western Massachusetts. 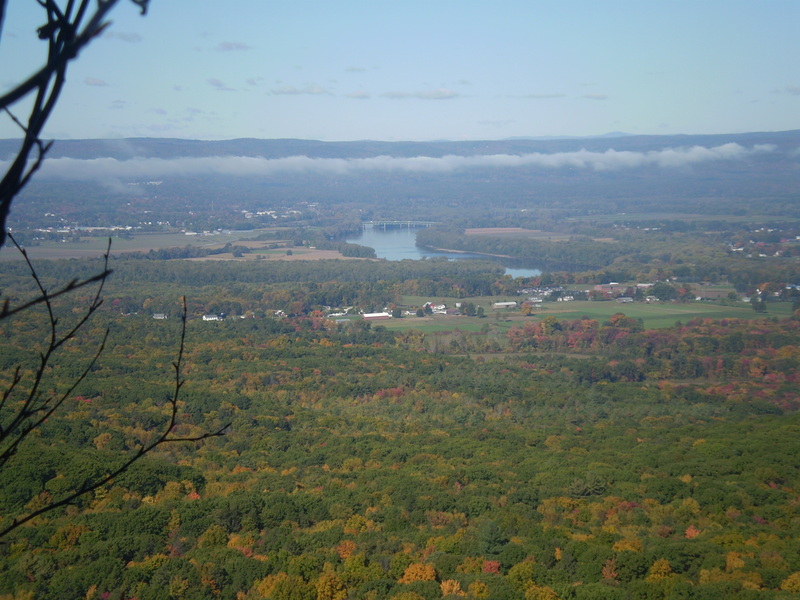 Although its tallest peak is only 1,106 feet above sea level, the range appears taller because it rises so abruptly from the Connecticut River Valley floor, an average of 800 feet from base to ridgeline. 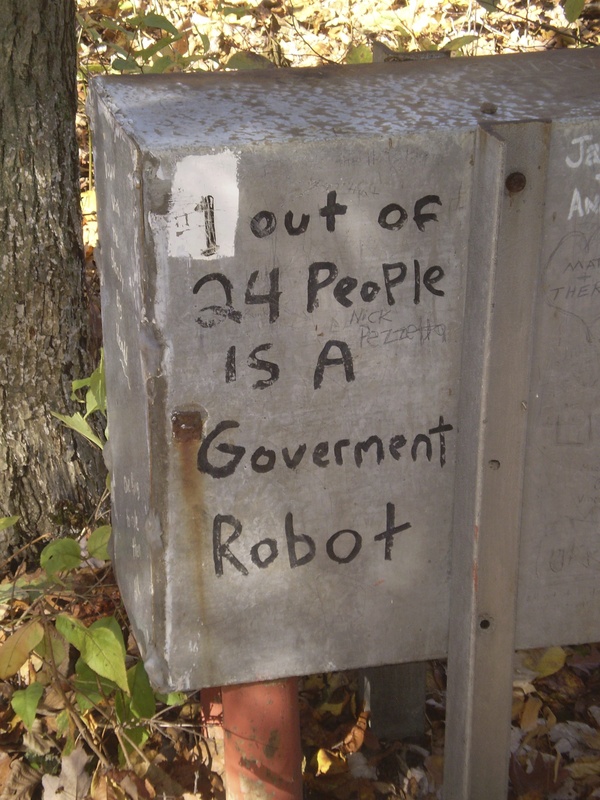 The system is a continuation of the Mt. Tom Range to the west; both are sub-ranges of the Metacomet Ridge, which runs mostly north-south between New Haven, Connecticut, and Greenfield, Massachusetts. The ridge, named for the seventeenth century Native American leader Metacom, or King Philip, is geologically distinct from the nearby Appalachian Mountains, being composed primarily of volcanic basalt, or trap rock. Much of the Holyoke Range is conserved today as the Joseph Allen Skinner and Mount Holyoke Range State Parks of the Massachusetts Department of Conservation and Recreation (DCR); together, they contain about 3,000 acres of protected land, used by area hikers, picnickers, and sightseers. The two parks are divided by Massachusetts Route 116, which travels between Amherst and South Hadley through the Granby Notch. For the towns along Massachusetts Route 9 north of these hills – namely, Northampton, Hadley, and Amherst – the range is a prominent feature of the local landscape. 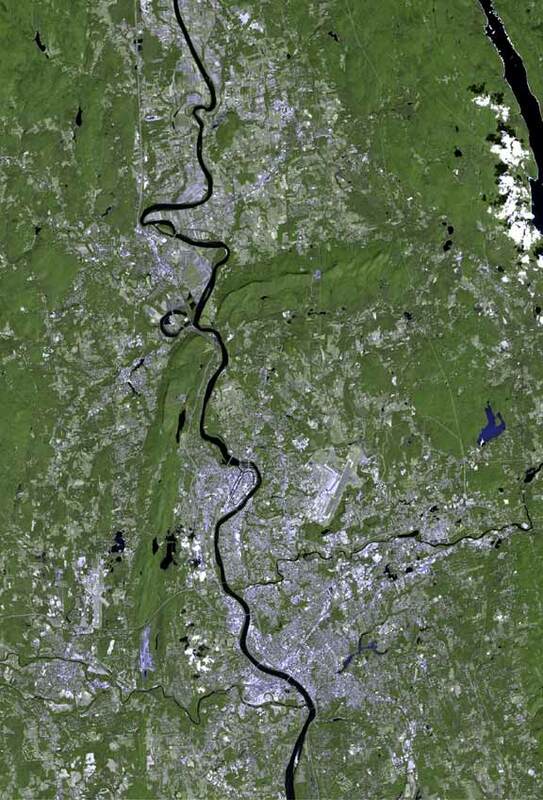 In fact, one can visually organize this area, sometimes called the Upper Pioneer Valley, along three axes: the Connecticut River, which flows roughly north-south; Massachusetts Route 9, which crosses the river on the Calvin Coolidge Bridge in Northampton and travels roughly east-west; and the Holyoke Range, several miles south of that, also oriented east-west. 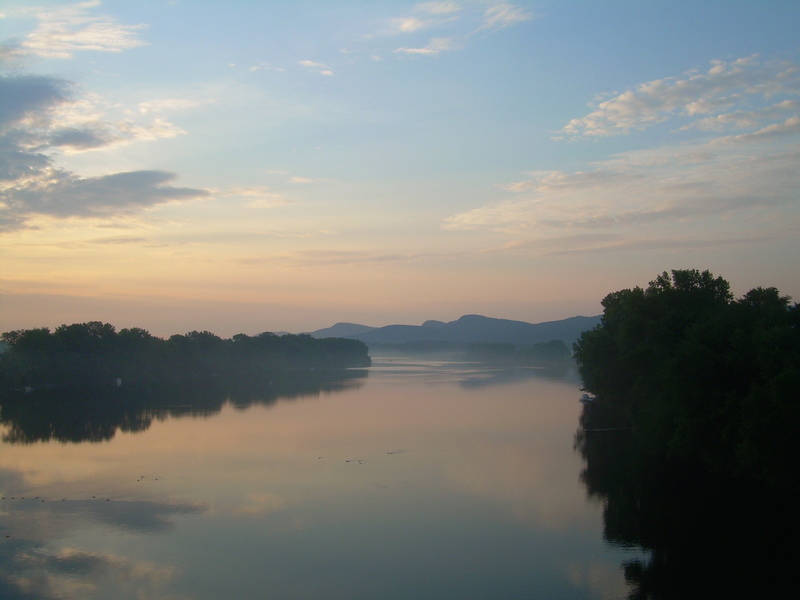 Indeed, the best view of the Holyoke Range may be from the middle of the Coolidge Bridge looking south. Unfortunately, the bridge is the only river crossing for more than 30 miles, and the road that uses it is heavily traveled. What’s worse, the only sidewalk on the bridge is on its northern side. To get to the southern side for an unobstructed view of river and range, you have to cross four lanes of traffic; once there, you’re unnervingly vulnerable to the cars, trucks, and buses whizzing past, just a foot or two away. 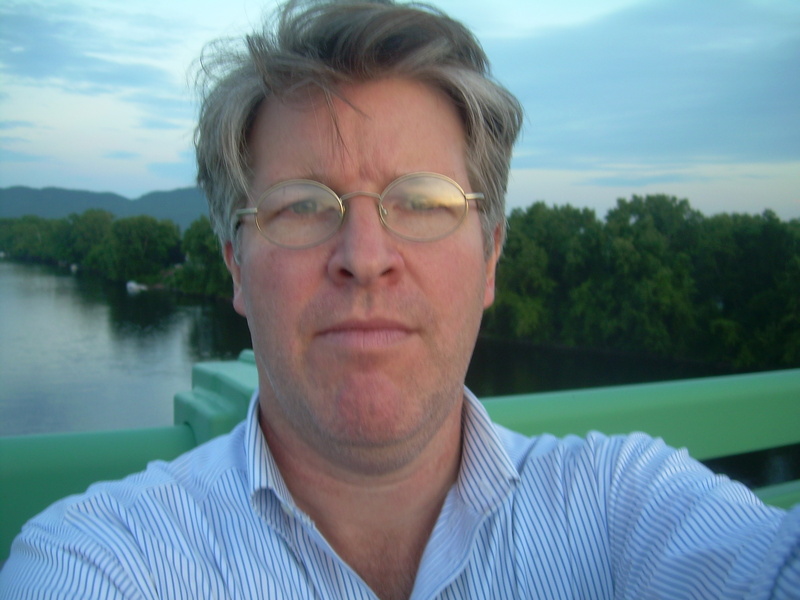 I know all this because, on more than 140 occasions, between November, 2007, and November, 2009, I walked or rode my bike from the center of Northampton, where I live, to the center of the Coolidge Bridge, about a mile away, to take photographs of the Connecticut River and the Holyoke Range. The visits took place in every season, at every time of day, in every kind of weather. In the end, I amassed more than 2,000 photographs of the river and mountains, each one taken from the same vantage point yet different, in its way, from all the others. I was motivated to undertake the project because, when I first moved to Massachusetts in the summer of 2006 and started taking the M40 bus every morning from Northampton to the campus of the University of Massachusetts Amherst, where I work, I was struck by the view south that opened up at the top of the Coolidge Bridge – the lush green river banks to the sides, the deep blue water flowing past, the sun-lit mountains in the distance, the endless blue sky above – a scene that, to my dismay, whooshed by at 30-40 miles per hour. On the bus – especially if I was sitting by a south-facing window – I could linger on the view longer than if I had been driving a car; still, I wanted to stop and look more closely. So one evening after work, soon after moving here, I walked to the middle of the Coolidge Bridge with my camera, crossed the four lanes of traffic, leaned over the southern railing, and took several photographs of the scene before me. I realized immediately that I would need to come again in the morning, when the sun would be rising behind the mountains; in the middle of the day, when the landscape would be lit, brightly, from overhead; in late fall, when the leaves of the riverside trees would have changed color; in the middle of winter, when everything would be covered in white . . .
And, in fact, I returned to the bridge, again and again, for all those, and other, scenes. The view south never disappointed – but the project itself turned out to be more difficult than I had envisioned. The main reason was traffic. I discovered that the only peaceful time on the bridge, during the day at least, was in the early morning: it became my favorite time to visit. Still, I tried to go as often as I could at other times – though, in the late afternoon and early evening, when traffic was heaviest, I endured considerable stress, and even abuse, from the passing vehicles. There was also the weather. I had begun the project in mid-November – still a relatively nice time of year to be out around here. But in January, when visiting the bridge at 6:00 a.m., the project seemed insane. There was ice, sleet, snow, wind, freezing rain, fog – and brutal cold. If each visit offered the possibility of a different, and unique, view south, there were times when I longed for a project that required less hardiness on my part. I also had equipment problems. I used cheap point-and-shoot digital cameras for the project; I dropped the first one in June, 2009, though I kept using it for several weeks with a shattered viewfinder. The worst problem, though, occurred on July 9, 2008, when, after more than 70 trips to the bridge, and probably 1,500 or more photographs, the hard drive on my computer crashed, and I lost 21 days of pictures that I had not backed up – nearly a third of the accumulated total. I was devastated. For a year, I didn’t go to the bridge at all; and I took no photographs of either the Connecticut River or the Holyoke Range. But the unfinished project gnawed at me. And the thousand surviving photographs taunted me. There were moments of mystery and revelation in them, even with my cheap camera, my clumsy photography skills, and my precarious perch on that southern rail. I couldn’t believe I had given up so easily. So, in May, 2009, the time of year when my earlier photographic record had ended, I started going back to the bridge to take pictures, and I continued doing so until mid-November, 2009, the time of year when I had started the project in 2007. In the end, I completed a full cycle of seasons on the bridge, even if it took me two years to do so. I’m not sure what I will do with all those pictures. For a while, I thought I might write a book around them. Or mount some kind of exhibit. Or create an online, multi-media text. I may yet try to do one of those things. But even if I don’t, the project has been a blessing to me. For one thing, it led to one of the first non-academic essays I ever published, about the Northampton Meadows. It was also, in a way, the inspiration for this blog. The project stoked other desires as well. Standing so often on that bridge, peering so intently at that ridgeline, photographing that river and those mountains in such different kinds of light, in so many types of weather, I became curious about what exactly I was looking at. What was that rounded knob that seemed to insinuate itself in the center of my viewfinder every day? Could I hike up to it and, once there, look down on the bridge, just as I was now on the bridge looking up at it? I was experiencing an impulse we all have, I think, for reciprocity, for imagining what it is like to be in the place of another and to see ourselves from that place. When I looked from the bridge to the range, in other words, I began to imagine looking from the range to the bridge. And when I took photographs of those mountains, I began to wonder: Was someone in the mountains taking photographs of me? But before I could act on this impulse, before I could actually go up to the mountains and look back at the bridge, I had to figure out exactly what part of the range I was looking at. Now, when most people think of the Holyoke Range, they think of Mt. 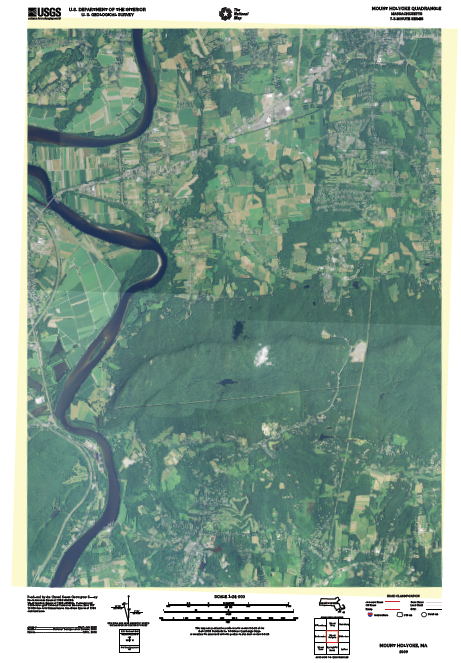 Holyoke itself, the westernmost peak of the system, which rises abruptly on the east side of the Connecticut River, just as Mt. Tom rises, equally abruptly, on the west. Mt. Holyoke is the most famous mountain around here. It has been a well-known tourist attraction since the early nineteenth century, site of the much-visited Summit (or Prospect) House, foreground of one of the most celebrated landscape paintings in U.S. history, and destination for a century and a half of “Mountain Day” at both Mount Holyoke and Smith Colleges. I had been to the top of Mt. 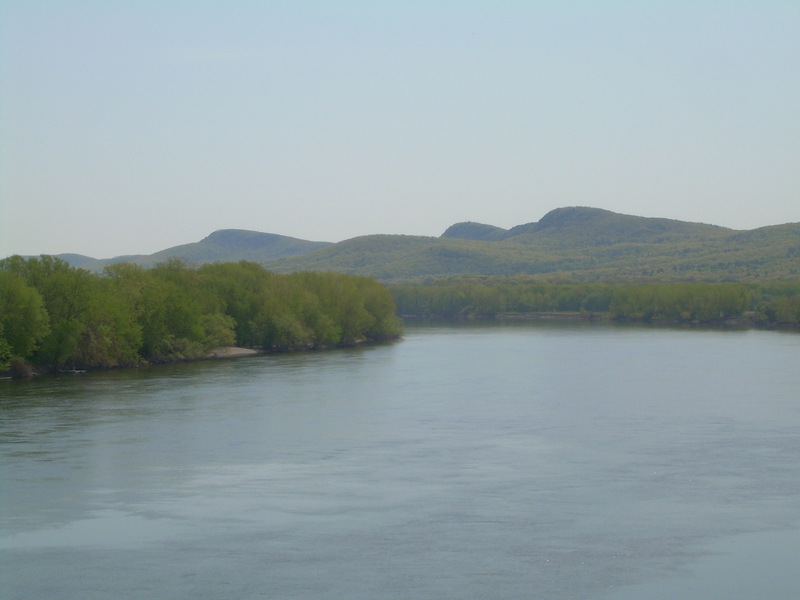 Holyoke many times: hiked up it, driven to it, taken friends and family to see it, enjoyed picnics on it, looked out at the Connecticut River and the Northampton Meadows from it. Mt. Holyoke was not what drew my gaze when I stood at the southern railing of the Coolidge Bridge and looked south down the river toward the range. The most prominent feature of that landscape, and the center of so many of the photographs I took during those two years, was some other mountain, or, rather, group of mountains, further east – peaks that, at first, I didn’t know the names of. In the far left of my viewfinder, of course, was the distinctive bulk of Mt. Norwottuck, with its sheer northern face, the tallest peak in the Holyoke Range, and historically and geologically interesting in its own right. It was on the other side of Granby Notch from the rest of the range, in a whole other state park. I had been there several times with one or both of my daughters. We would get box lunches at Atkins Farms, park at the Notch Visitors’ Center on Rte. 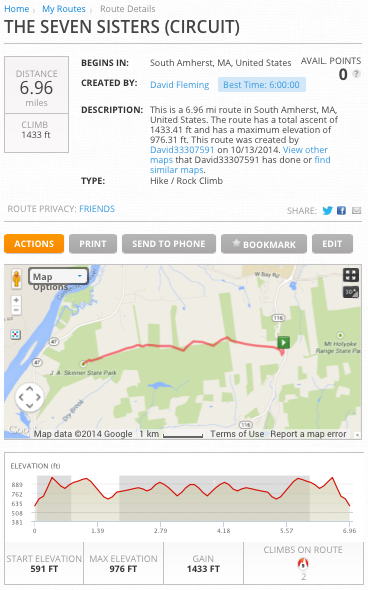 116, and hike the Robert Frost Trail, on the northern slope of Mt. Norwottuck, in woods cool and dim. We’d explore the Horse Caves, have a picnic on the summit, and later walk back to the Visitors’ Center. It’s a lovely place. But it’s not what I was drawn to from the center of the Coolidge Bridge looking south. The fact is, the Holyoke Range between Mt. Norwottuck and Mt. Holyoke is less distinct, less famous, less well mapped and less traveled than the two peaks on either end. But from the bridge, it was precisely this long, in-between section that was most prominent in my viewfinder – and that I found so familiar after two years of staring that I could practically draw it in my sleep. It was four to five miles of undulating ridgeline, perhaps seven to ten different peaks altogether, with dips of various length and steepness in between. On the bridge, I began to trace my finger along that line – starting from Mt. Norwottuck in the east and following the undulating ridge west, or, starting from Mt. Holyoke in the west and moving my finger up and down to the east. Framing the eastern end, there was the relatively deep Granby Notch; on the western end, the shallower Taylor Notch. Between them were several features that, it turns out, did have names. 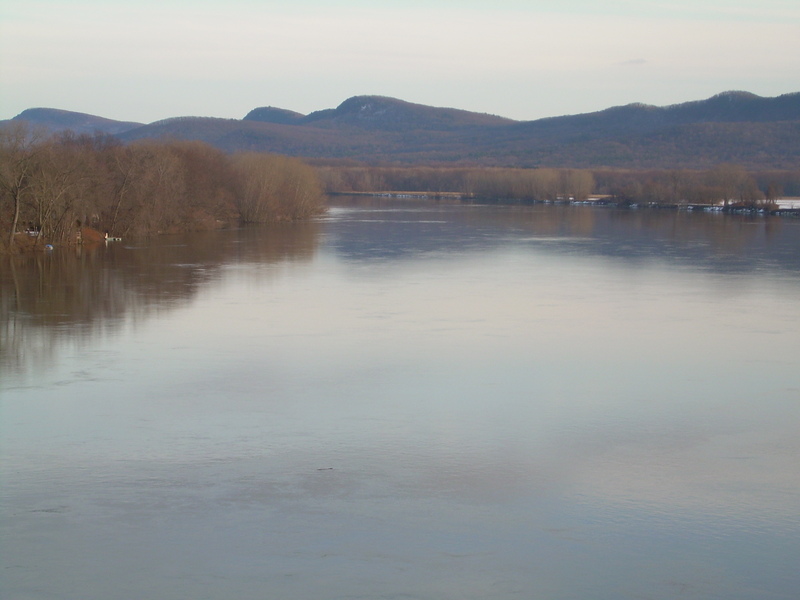 From east to west – or, left to right when looking from the Coolidge Bridge – they were, first, Bare Mountain and, then, Mt. Hitchcock, with a smaller, unnamed peak between and the low, dome-like Tinker Hill in front, outside of the east-west line of the rest of the range. After Mt. Hitchcock, moving west, came a long, rather gentle-looking slope down to what some maps called “The Low Place,” and then a short rise up to a series of smaller peaks, undulating up-down, up-down, all the way to Taylor Notch. These were the Seven Sisters. I now had what I felt to be a firm visual grasp of this western section of the range, from notch to notch, at least as it appeared from the Coolidge Bridge. And I even knew the names of all the key landmarks. More importantly, staring at the two-dimensional surface of the photographs I was taking and the maps I was consulting, I could imagine walking – happily, effortlessly – the whole ridgeline from east to west and back again. I first attempted to climb Mt. Hitchcock, and take a photograph of the Coolidge Bridge from it, on August 10, 2009. I failed. I had never been to that part of the range before – never hiked west from the Notch, didn’t realize what a steep climb it was to the top of Bare Mountain, had no idea how dense the forest was east of that or how rugged the terrain. On top of all that, it was an unusually hot day: I sweated profusely as I clambered up and down the muddy hillsides. Five days later, on August 15, 2009, I tried again. This time, I succeeded in finding the summit of Mt. Hitchcock, which turns out to be at the end of a short side trip just off the main trail: you have to pay close attention or you’ll miss it. From that peak, I could just make out tiny Coolidge Bridge in the distance. My journal entry for the day, unfortunately, is thin. I know I made it, though, because I took a photograph of the sign marking Mt. Hitchcock. 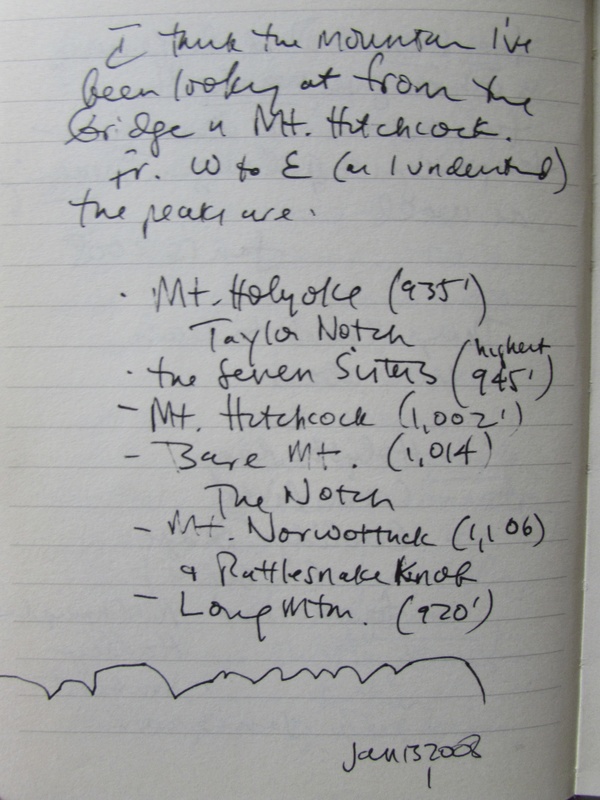 That day I also formulated a new plan: to walk all the way from the Granby Notch to Mt. 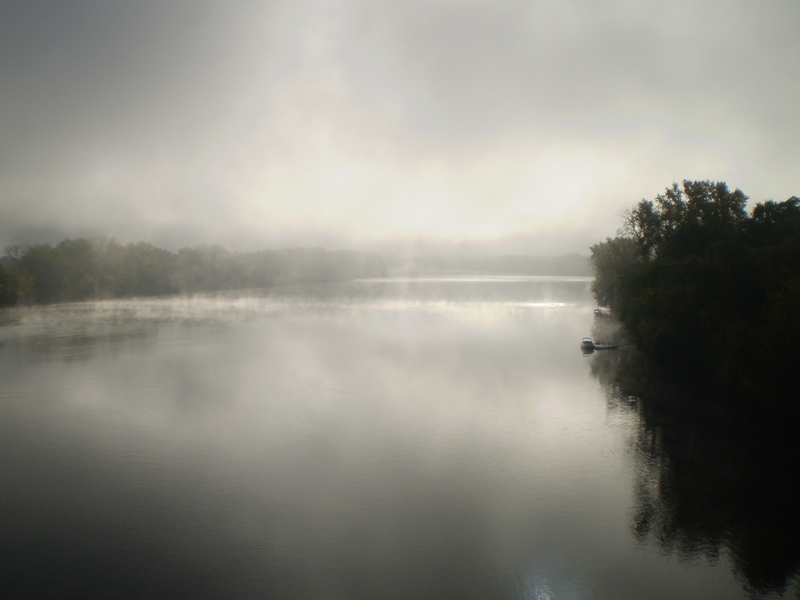 Holyoke and back – the whole ridgeline that I had gazed on so often from the bridge. Today, on the third attempt, I made it on foot from the Notch (MA 116) to the Summit House (Mt. 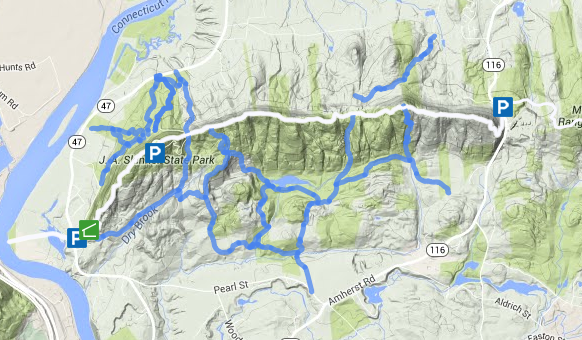 Holyoke) on the Metacomet-Monadnock trail – about 12 miles total in a bit more than 5 hrs. I left about 8:45 am, stopping at the bridge first for pictures. It was a little chilly – I took food & water, even read a bit at the Summit House, where there were too many people for my taste. I was alone much of the day, esp. thru the Seven Sisters, my first time on that part of the trail. Some tough going esp. that long slope on the west of Mt. Hitchcock, which is hard on the return. I came back, took a bath, & tried to take a little nap. I feel exhausted but glad I finally did it. It was one of the more grueling day hikes I’ve ever been on, with constant and abrupt elevation changes; but there were stunning views from the two ends: Bare Mt. in the east and Mt. Holyoke in the west. 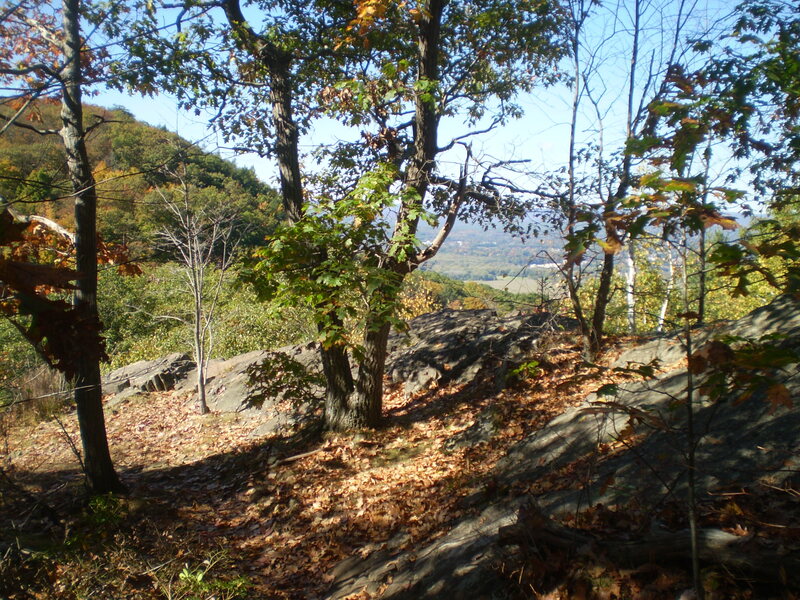 The woods are not what people usually dwell on when they talk about the Holyoke Range, which has been better known, historically, for its geology, for its abrupt rise from the Connecticut River Valley floor, for its famous peaks and stunning views. And, indeed, I had begun this project primarily focused on vistas – dramatic and, to be honest, somewhat obvious views out and away, whether from the center of an isolated bridge on a wide river, looking out at the vast scene beyond and above, or from the top of a nearby mountain, looking back at the tiny bridge from which I began. This was how I thought about that project for the longest time. And yet, after I actually found my way up to those mountains and hiked that ridgeline, from notch to notch, peak to peak, what I couldn’t get out of my mind was the dark, thick, unknown, unseen forest within. Halfway up those hills, or in the low places between, I would stop and slowly turn around, looking from the ground up, past the dark trunks around me, to the light-speckled treetops above. Everywhere was the pervading scent of decaying leaves; the only noise, the breeze wending its way slowly through the woods. I was alone, deep in a forest, in one of the most densely populated areas of North America. To my sides was a steeply rolling green and brown terrain, crowded with dark vertical lines; above, through golden, swaying leaves, I caught glittering glimpses of a bright blue sky. It would be five years, to the day, before I returned to the Seven Sisters. Despite the importance of that October, 2009, trip for my project, I never really wrote about it; I must have known that I would return to the interior of the range one day to confirm my experience of it. Columbus Day weekend, 2014, seemed like the ideal opportunity. The weather looked good, and, with Monday off, I knew I could devote myself to a long Sunday hike and still have a full day of rest before returning to work on Tuesday. For the week beforehand, I could think of little else. Unlike the last time on the ridge, I would know this time exactly where to go and what to expect. There was no pressure to complete a project; I could just enjoy it. On the appointed day, I left early from Northampton. Crossing the Coolidge Bridge, quiet on a Sunday morning, I couldn’t help but glance over to the right to take in the view. The entire scene was covered in fog – wispy enough that I could still make out the riverbanks and the faint line of the mountains in the distance. I drove east toward the Granby Notch – but before I even got to the Hadley Common, I turned around. Tapping me on the shoulder was my old nemesis: the project. How could I take this daylong hike – only the second time I would ever traverse the western ridge of the Holyoke Range – and not record the view from below? So I went back to Northampton, pulled in to the little parking lot on Damon Road, and walked up to the bridge to take my first photograph from the southern rail in nearly five years. Now a little behind schedule, I got back in my car and headed again for the Notch, driving east on Bay Road through Hadley and Amherst, passing farm after farm with pumpkins for sale. The parking lot at the Notch Visitors’ Center on Route 116 was already filling up, some people heading east toward Mt. Norwottuck, others (like me) heading west toward Mt. Holyoke. In the map below, you can see the parking lot at the Notch Visitors’ Center on the far right. My route was leftward. The trail I would be hiking, from Rte. 116 up Bare Mountain to Mt. Hitchcock, then down to the Low Place, up and across the Seven Sisters, down to Taylor Notch, and up Mt. Holyoke – and then all the way back – was the Metacomet-Monadnock Trail, a 114-mile-long hiking path in west-central Massachusetts and southern New Hampshire, which connects the Metacomet Trail in Connecticut with Mount Monadnock in New Hampshire. It has been in existence for over half a century, though parts are far older than that. The trail is marked, or “blazed,” with white rectangles painted on trees and rocks throughout its length. By the early 1960s, Banfield and his team had finished the trail and published the first Metacomet-Monadnock Trail Guide, now in its 10th edition and still available for purchase at area bookstores and through the website of the AMC’s Berkshire Chapter. 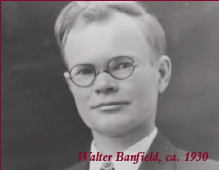 Banfield himself lived until the age of 95, dying in Amherst in 1998. He remained active well into retirement, helping maintain his beloved white-blazed trail. 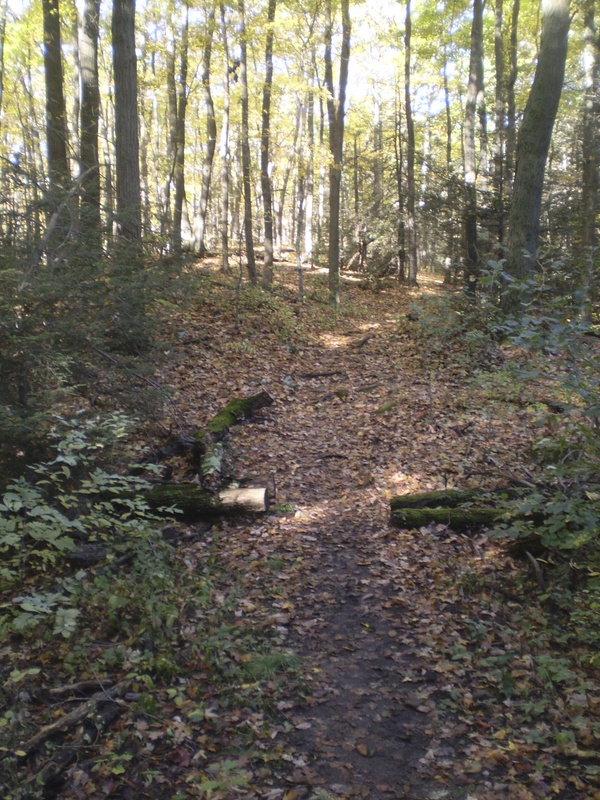 In 2009, the entire 215-mile route of the combined Mattabesett, Metacomet, and Monadnock (M-M-M) Trails, extending from Long Island Sound in southern Connecticut, through west-central Massachusetts, and into southern New Hampshire, was designated the New England National Scenic Trail or NET. Starting, as I did, from the eastern end of Section 7, at Granby Notch, and heading west (leftward on the map), the M-M Trail first travels up Bare Mountain, one of the steepest climbs of the whole trip (see the photograph below). 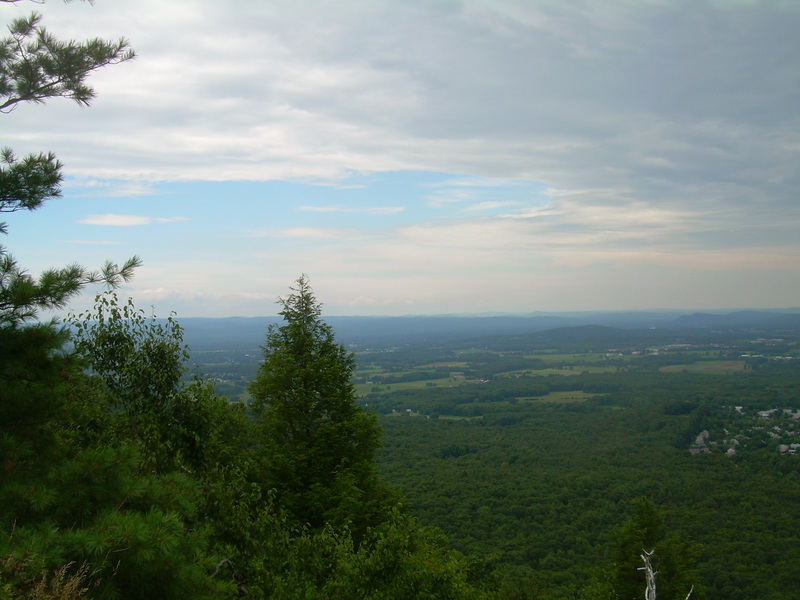 Since there’s a lovely view from that summit, and since, further west, the trail enters rather deep forest – and what feels like an endless succession of abrupt and grueling elevation changes – many hikers park at the Notch, walk up Bare Mountain, have a picnic at the top, and then return the same way (much as they do on the eastern side of the Notch, to and from the top of Mt. Norwottuck). But I had much further to go. So, at the summit of Bare Mt., I stopped to take a photograph, looking north towards Amherst (as you can see, the fog had not completely burned off), and then I moved on. I was now headed due west, into the interior of the Holyoke Range. Despite these signs of human presence at the two ends of the hike, for most of the day, I was inside a forest, and evidence of civilization was scant. The next stop, two peaks over from Bare Mt., was Mt. Hitchcock. Of course, this had long been a focal point of the range for me, given its prominence in so many of the photographs I took from the Coolidge Bridge. The peak, it turns out, is named for Edward Hitchcock, professor of chemistry, geology, natural history, and natural theology at Amherst College from 1825 to 1864 and president of the college from 1845 to 1854. An ordained minister interested in geology, Prof. Hitchcock attempted in both his ministerial and scholarly writings to reconcile science and religion, a challenging task then as now. It was Hitchcock who named Mt. Norwottuck (using one of the Native American words for this area); he helped clear some of the footpaths up Mt. Holyoke as well. Edward Hitchcock also studied and wrote about the fossilized dinosaur tracks that can still be seen in this region, especially in low-lying areas near the Connecticut River; and he gave his own name to the prehistoric lake which once covered much of the Upper Pioneer Valley. Hitchcock’s son, Edward, Jr., was a friend of Austin and Emily Dickinson and later, like his father, a professor at Amherst College. When I arrived at the somewhat cramped lookout on Mt. Hitchcock, with its view north of the Upper Pioneer Valley, there was already a family there, sitting on the rocks. 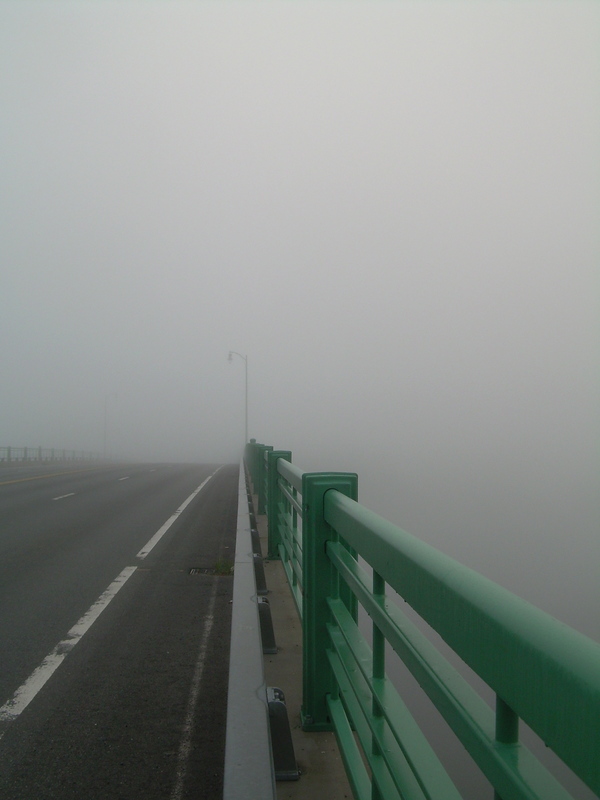 I took a photograph of the Coolidge Bridge, visible in the far distance, and kept walking. It’s here, between Mt. Hitchcock and Taylor Notch that the western Holyoke Range, in my opinion, becomes truly interesting. This is the part of Section 7 of the M-M Trail that includes most notably, from east to west, the hike down Mt. Hitchcock to the Low Place and the climb up and across the Seven Sisters to Taylor Notch. It’s a physically demanding but beautiful hike – and yet it’s a section of the range that remains largely unmapped, undescribed, and unknown. The trail is ever rising and falling over the endless succession of minor hills that make up the range. But it is all forested, wild, quite unspoiled countryside. When it comes to actually listing and describing trail landmarks, however, this part of the hike is seriously shortchanged. 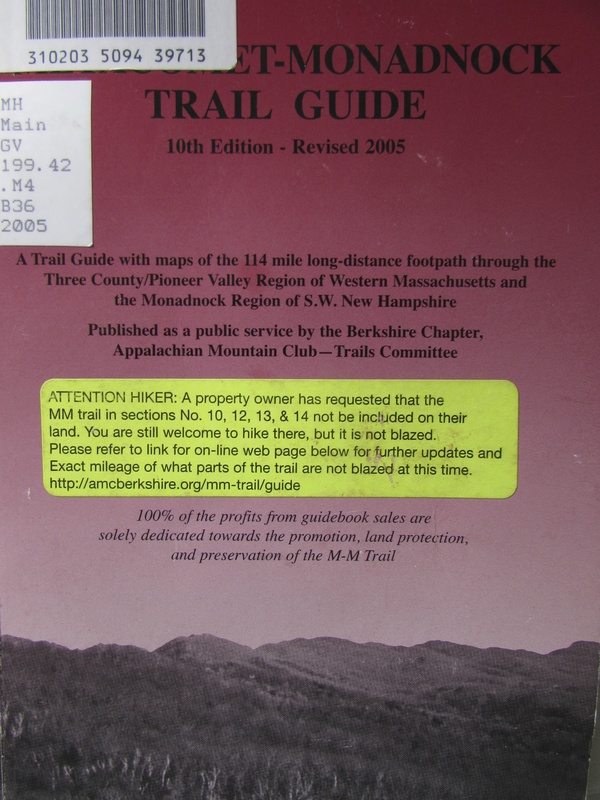 The guidebook devotes 30 of 47 lines here to the 2-mile section of the M-M Trail between Hockanum and Taylor Notch, focusing especially on the western ascent of Mt. Holyoke itself, and another 11 lines to the 1.5-mile section between Mt. Hitchcock and Granby Notch, leaving just 6 of 47 lines for the 2.6 mile section between, which, in my opinion, is the most interesting part of the whole hike. Neither the Seven Sisters nor the Low Place is even named. 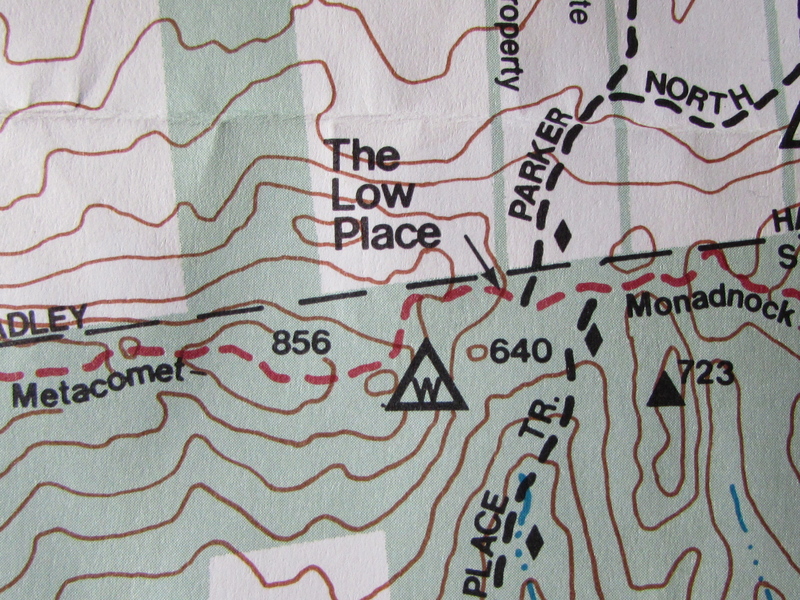 The guidebook mentions only three landmarks, unnamed peaks of 897, 858, and 919 feet, between Taylor Notch and Mt. Hitchcock. The M-M trail now climbs steeply east to a rocky ledge west of hill 897′, the eastern rim of Taylor Notch. At 3.9 mi. pass over the top of the hill 858′, with limited views north, and at 4.2 mi the top of hill 919′. At 5.2 mi. after a steep climb from the “Low Place” trail junctions, the crest of Mt. Hitchcock is met. And that’s all we get! Similarly, in Bruce Scofield’s Hiking the Pioneer Valley (third ed., 2003), there are circuit hikes described and mapped for both Mt. Holyoke and Mt. Norwottuck but nothing for the ridgeline in between. In fact, according to the Massachusetts DCR website for Skinner Park, “The Mt. Holyoke Range constitutes one of the largest remaining unfragmented forests in Massachusetts (over 8,000 acres, including Mount Tom).” Christopher J. Ryan’s map of the Holyoke Range State Park (western section, fifth ed., 2001) makes much of this forest and a unique and interesting fact about it: the ridgeline of the Holyoke Range, according to Ryan, is the meeting place of two forest types: the oak, hickory, and heath of southern New England, at home in the warm, dry habitat of the gentle south slope of the range, and the hemlock, white pine, beech, and birch of northern New England, more at home in the cool, moist habitat of the steep northern slope. The unusual east-west orientation of the Holyoke Range makes this remarkable meeting of forest types possible. And yet, guidebooks would have us ignore this interior landscape of the range for the more dramatic views of its summits. The overall elevation change involved in the hike, unfortunately, is difficult to pin down. According to newenglandtrail.org, section 07 of the M-M Trail has a total elevation change of +2,200 ft. and -2,615 ft. But the wikipedia site for the Seven Sisters, which describes that terrain as “very rugged,” claims that “a continuous walk along the ridgeline includes an overall elevation change of 3,700 ft.” (How are these numbers derived?) The calculation provided by mapmyhike.com, meanwhile, puts the total “gain” of the hike at 1,433 ft. You can see that website’s elevation profile, calculated for the round trip version of the hike, below. But it’s not just that the trail is constantly going up and down; the terrain on either side of the trail falls off precipitously. 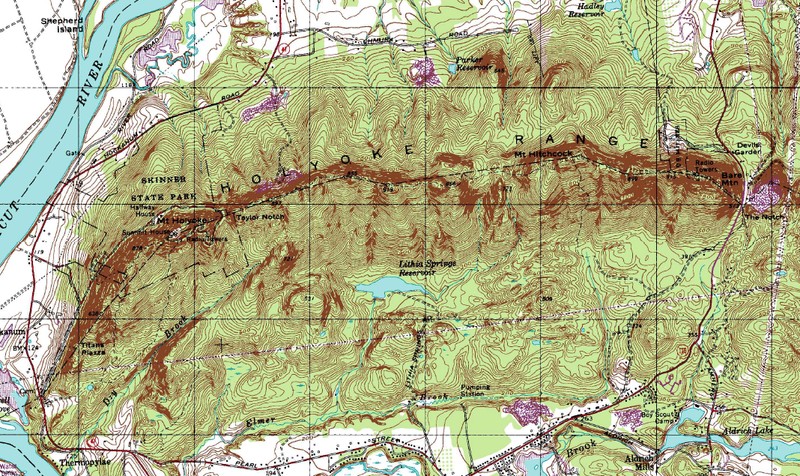 You can see that in this detail of the USGS map of the area – the darkly-colored parts reveal contour lines almost impossibly close together, indicating very steep hillsides. After leaving the summit of Mt. 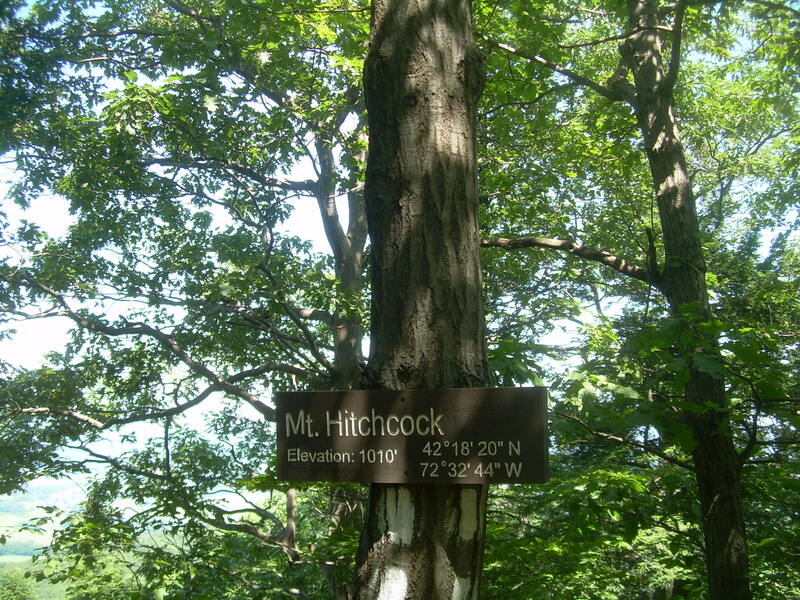 Hitchcock, I began the long westward descent into the forest of the Holyoke Range. Although I continued to encounter other hikers (this was a holiday weekend, after all), their numbers dropped off. And for good reason: the trip down that mountain, despite the gentle slope presented to viewers from the Coolidge Bridge, is surprisingly steep – it’s hard not to anticipate how difficult it will be on the way back. At the bottom of the slope, between Mt. Hitchcock and the Seven Sisters, is the Low Place. Suddenly, after all the intense ups and downs of the first part of the hike – the steep climb up Bare Mountain, the many hills between it and Mt. Hitchcock, and the long descent from that latter peak – and before another set of climbs and descents to come, there’s a lovely moment of flatness, of level ground, of ease and relaxation, at the bottom. The terrain is so gentle here you’re able, for what seems like the first time all day, to stop and look up, to admire the treetops, to take in the forest view all around you. And, because this is also a place where several trails converge – the white-blazed M-M Trail going east-west intersects here with the blue-blazed Low Place and Parker Trails going north-south – one has the feeling of being at a kind of crossroads. It’s not an easy place to get to, but the Low Place is worth the effort. Soon you’re climbing again, and you realize that you’re now in the Seven Sisters. Banfield’s description of an “ever rising and falling . . . endless succession of minor hills” suddenly occurs to you. At first, you try counting the peaks as you encounter them – am I on the third one yet? 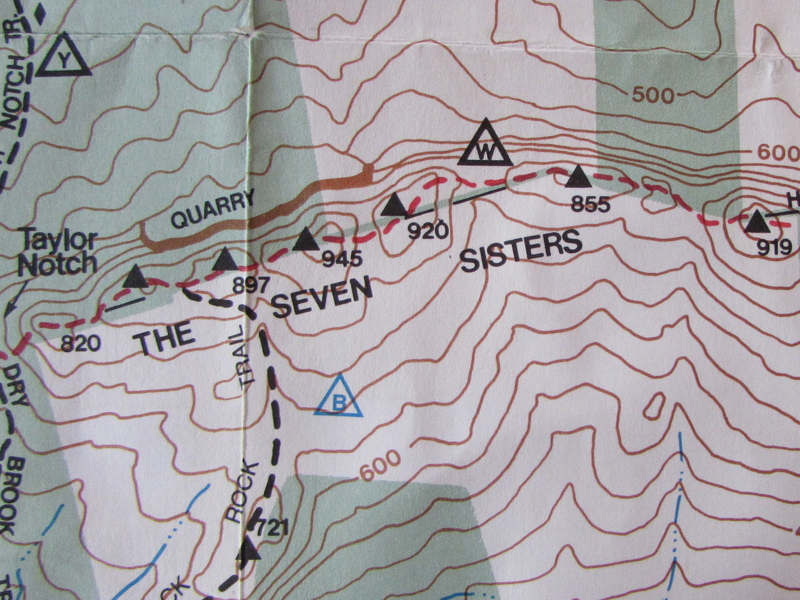 But after a while, you give up trying to make sense of the name “Seven Sisters.” After all, on Christopher Ryan’s map, only six summits are marked with triangles, though seven elevations are given, the triangles and numbers imperfectly aligned. There are no names for any of the individual peaks (which is probably why the M-M Trail Guide refers to them by elevation). Meanwhile, when you look at this part of the range from the Coolidge Bridge below, you sometimes count five peaks, sometimes six, sometimes seven, and sometimes eight. I think the name was derived poetically: “seven sisters,” after all, is alliterative; and, unlike “six sisters,” the two words have the same number of syllables. 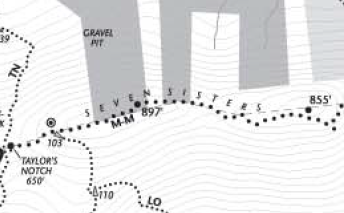 Oddly, the “Seven Sisters” are never mentioned in either Banfield’s original M-M Trail Guide or its latest, tenth, edition, though the name does show up in recent M-M Trail maps. The DCR’s map of Skinner Park also includes the name, though elevations for only two peaks are given there. Before too long, I reached Taylor Notch, crossed the paved road that takes cars up to Mt. Holyoke, and continued on the M-M Trail to the Summit House, with its famous views of the Connecticut River and the Northampton Meadows. I had been hiking for six hours, almost without stop – longer even than my 2009 trip. The total journey was somewhere between 8-12 miles. According to the tenth edition of the M-M Trail Guide, Section 7 is 6.6 miles long (one way) from Hockanum to Granby Notch, which would make my hike about 4.3 miles long one way, 8.6 miles round trip. Newenglandtrail.org, by contrast, puts Section 7 at 5.60 miles long; and mapmyhike.com calculated my walk at 3.48 miles one way, 6.96 miles round trip. All I know is that, in the end, I was exhausted. And yet, as the trip quickly recedes into the past, I find myself recalling only how nice it was to be in the woods that day, how different the range appeared inside from the way it looked outside, how unusual the forest felt compared to the world I normally inhabit. Thomas Cole’s View from Mount Holyoke, Northampton, Massachusetts, after a Thunderstorm – The Oxbow, 1836 is from the Metropolitan Museum of Art, gift of Mrs. Russell Sage, 1908. The painting is featured in two other posts I’ve written for this blog: one about the Northampton Meadows and another about Henry James. 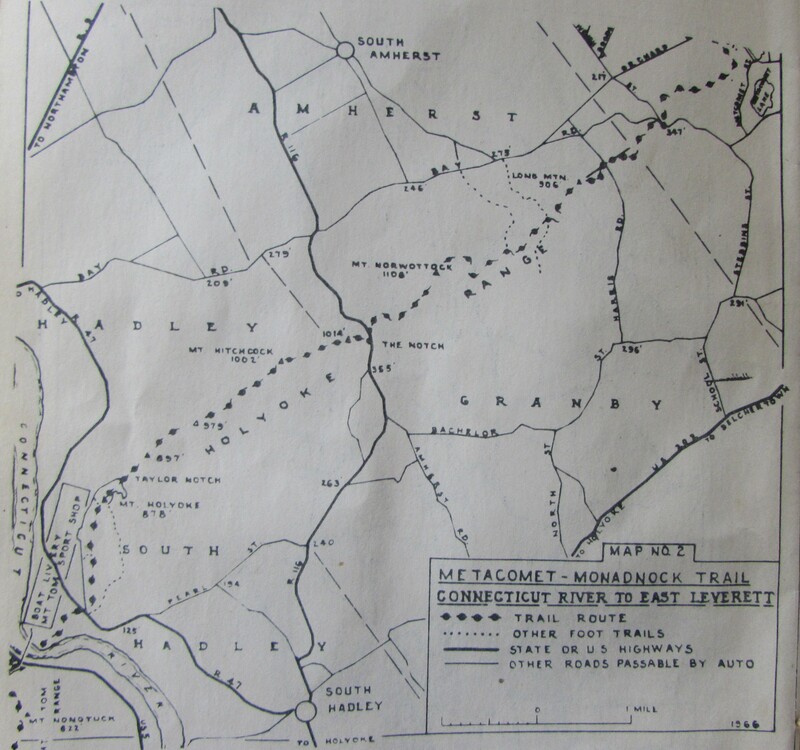 Walter Banfield et al.’s Guide to the Metacomet-Monadnock Trail in Massachusetts and New Hampshire, second ed., was published by the Berkshire Chapter of the Appalachian Mountain Club (AMC) in 1966. (I would like to have found a first edition for this post; alas, I did not.) 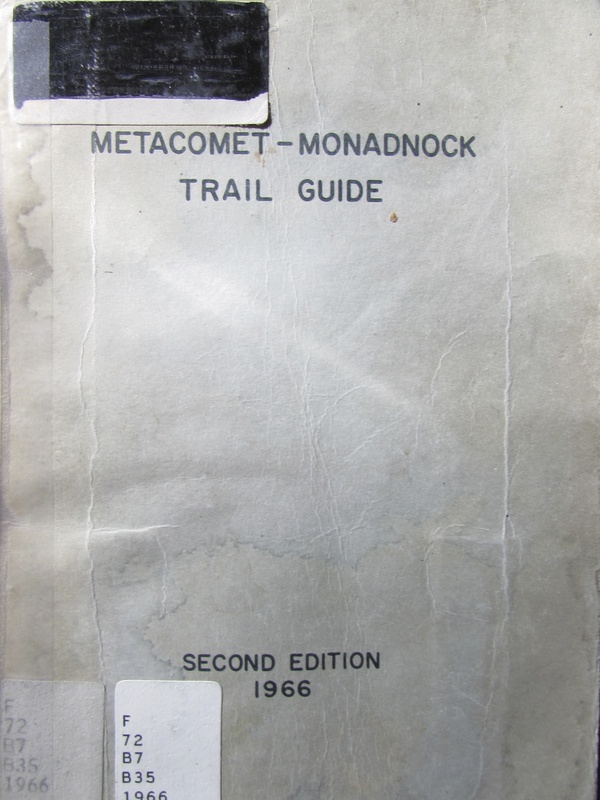 The tenth edition, now called Metacomet-Monadnock Trail Guide, was published by the same group in 2005 (information on ordering the book can be found here). 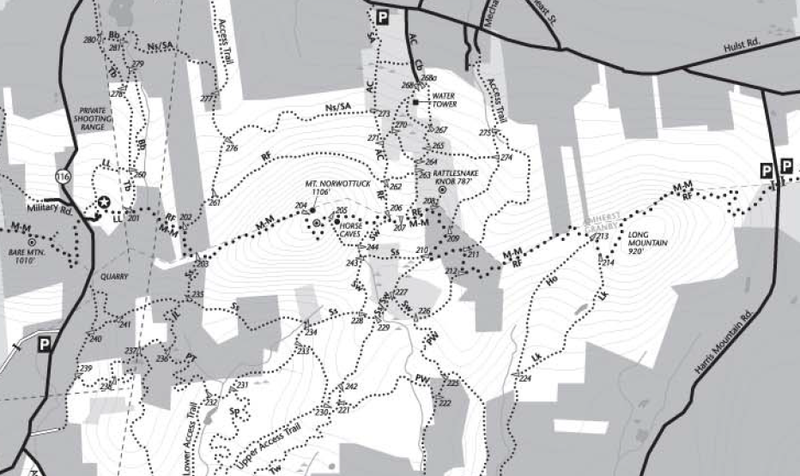 The Berkshire Chapter’s online guide to the Metacomet-Monadnock Trail can be found here; click on “Section 07: MA 47 (Hockanum) to MA 116, “The Notch” Visitors Center.” The group’s page on the New England Trail (NET) can be found here. For the New England Trail’s guide to Section 07 of the M-M Trail, click here. For the NET’s interactive map, click here. For the National Park Service’s page on the NET, click here. For the website of the National Trails System, which includes a map, click here. 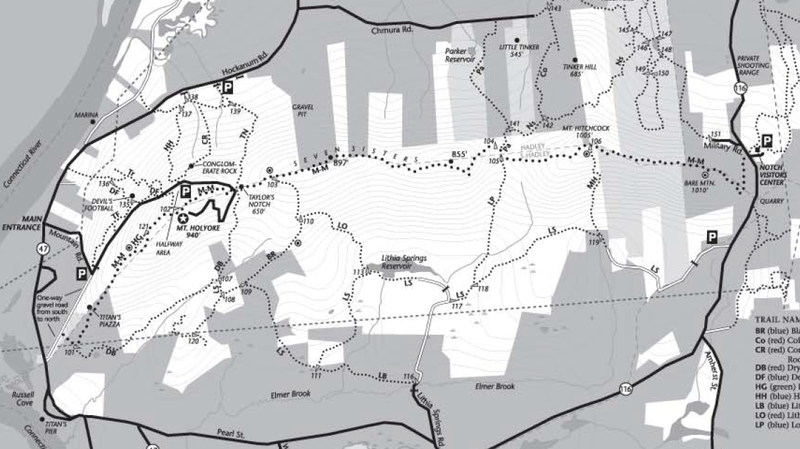 The Metacomet Monadnock Mattabesett Trail System: National Scenic Trail Feasibility Study & Environmental Assessment was published by the National Park Service in 2006. You can download the report here. 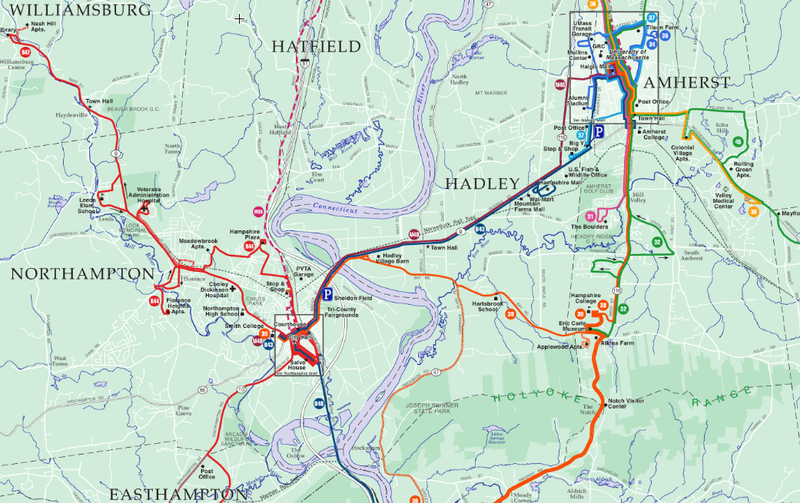 For the Wikipedia article on the Holyoke Range, click here; on the Metacomet-Monadnock Trail, click here; on the Seven Sisters, click here. 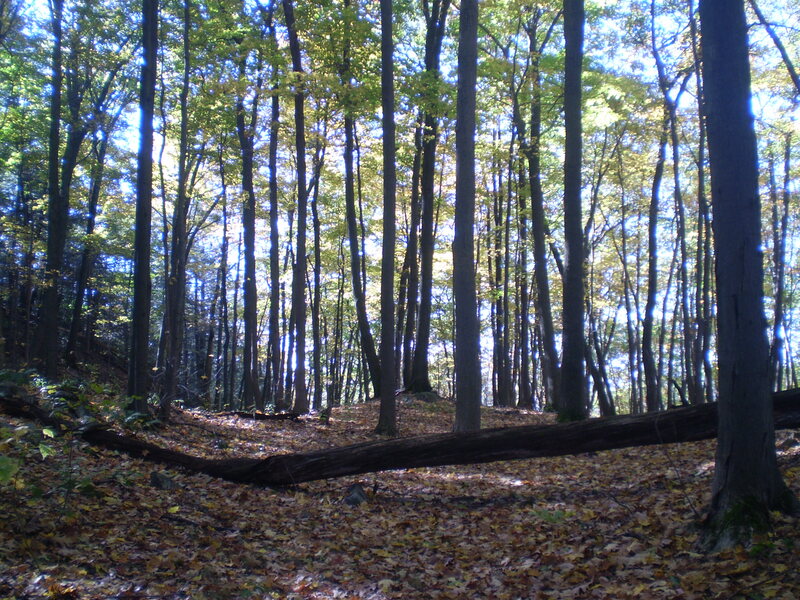 For the Massachusetts Department of Conservation and Recreation (DCR) website for Mount Holyoke Range State Park, click here; for the Joseph A. Skinner State Park, click here. Both sites include trail maps, nature guides, and other resources. 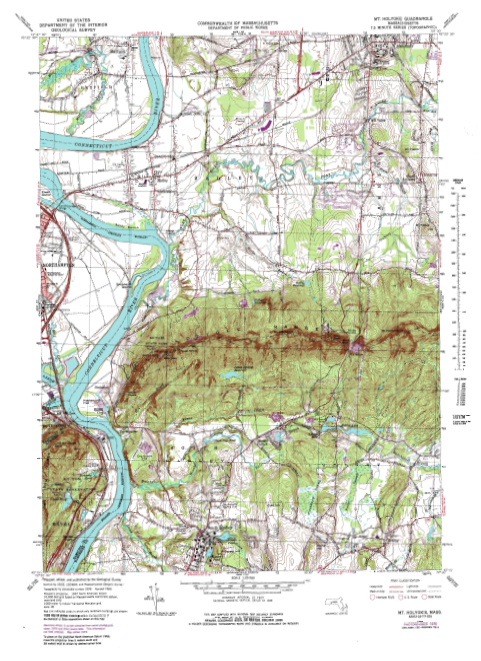 See also the map of Holyoke Range State Park, western section, fifth ed. (2001) by Christopher Ryan. The website of New England Cartographics (NEC), which publishes that map, can be found here. They are located in North Amherst, MA. NEC also publishes Bruce Scofield’s Hiking the Pioneer Valley: 30 Circuit Hikes in the Connecticut River Valley Region of Western Massachusetts, third ed., 2003. A 30-minute documentary video by local public television station WGBY, titled Focusing on the Range (2005), can be viewed here. 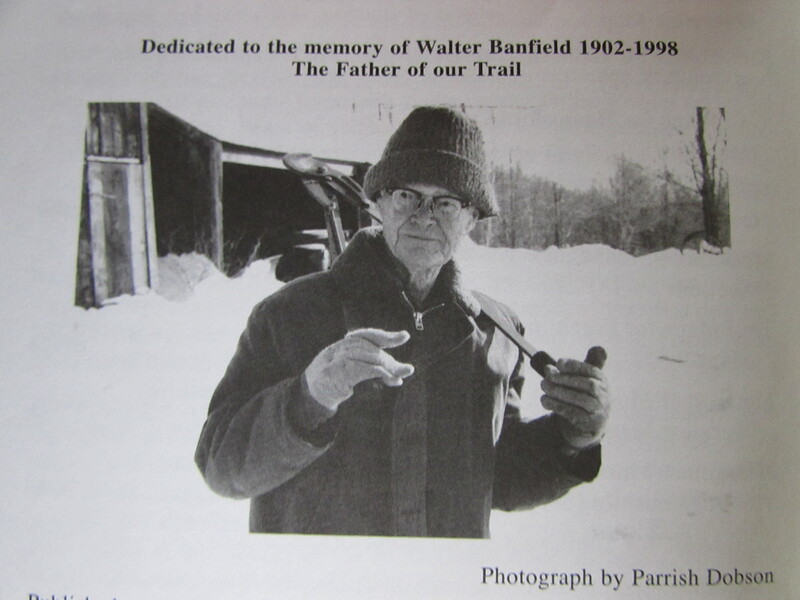 For the UMass Amherst Libraries’ Special Collections and University Archives page on Prof. Walter Banfield, click here. For the Amherst College Geology Department’s page on Prof. Edward Hitchcock, click here. For the Kestrel Trust, which supports land conservation in the Pioneer Valley, click here. This entry was posted in imaging, mapping, walking. Bookmark the permalink. One day I did a little Googling and came upon this article, which not only answered my question but provided lots of additional information and enjoyment. I liked the description of “reciprocity.” I’ve often felt that sensation when looking at a natural scene and wondering what it would be like to become more intimate with it. Thanks so much for the write up. I’ve hiked this trail for many years without knowing much about the history. I can truly appreciate how hard it is to count the sisters peaks. I rarely have enough time to go over and back and have found myself hiking a loop on the eastern end. Starting at the notch visitor center hiking up bare mountain over to hitchcock, down to the low place and around a currently unmarked trail (the north side) which loops back east along the northern base of the ridge taking you by the old SAC bunker site before returning to visitor center. It’s a great 3.5 mile loop and fun in both directions.